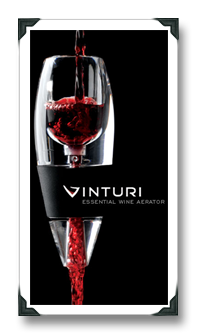 Vinturi Essential Wine Aerator Giveaway! Kicking off another giveaway, just because I can (hey, it beats being bored!). 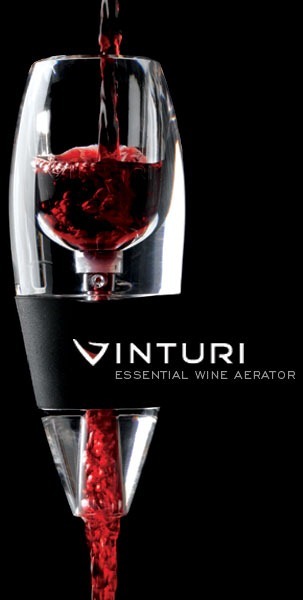 This time, we’ve got a brand new Vinturi Essential Red Wine Aerator (about a $35 value) to give away, something that I recently acquired from a gift basket left for me during Auction Napa Valley 2012. It’s branded with the Folie à Deux logo, so as long as you’re cool with that then you’re good to go for our latest giveaway! If you’re curious how well the it operates and the impact that it has on red wine vs. using a decanter, check out my previous Vinturi review (in summary: not as good as old-fashioned, time-tested decanting, but certainly not a slouch and it does help some wines to open up quite nicely). 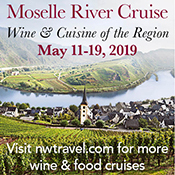 Now, listen up because due to my travel schedule – Rioja coming up next week, and then Crete very quickly thereafter (for a piece that will probably run in Sommelier Journal in 2013) – this giveaway will NOT run for the normal one week period here on 1WD, but will end Saturday, June 23 (when I will randomly select a winner from the comment authors). Here’s the skinny: Comment on this post (twitter and FB comments are welcome, as always, but they won’t count as an entry in the giveaway), with your answer to this question: When – and how – do you decant your reds? Is it only for older wines, younger wines, unfiltered wines you think will throw some sediment, or all three? Do you use alternative methods, like aerators, or a blender (seriously – search the site, that blender-as-decanter topic has gotten some airtime on this blog!). We’ve talked near and around that question before here on the virtual pages of 1WD, but have yet to really get into it. So… shout it out in the comments! I use a wine aerating pourer for most wines (old or young) I drink. I find this little tool really enhances the taste of wine, improves bouquet and flavor instantly. For a small pour, not an entire bottle, I'll use an aerator. For an entire bottle I use the sort of decanter that can readily return the wine to the bottle. That way we can decant several bottles without needing several decanters. We generally decant red wines with potential for being tanic, especially if they're not exactly mature. Some wines, like Nebiollo's, we will decant several, even many hours before we intend to serve them. I decant almost all red wines and some whites. The reds I don't decant are the older ones that haven't thrown a sediment as some fade really quickly. The other exception is Pinot. Older heavy whites I also decant as I don't mind a bit of funk in my reds but tend to dislike it in whites. Always decant, sometimes with a 'wineweaver' especially when my friend who bought it from the uk comes to visit. I use an aerator occasionally but most of the time I just decant. I use an aerator most of the time on reds and whites. My wife doesn't drink, so I generally don't decant a red wine when I'm the only one drinking it. I will decant "bigger" red wines when I have company to share the wine with. I gotta admit, I never got away from good old-fashioned decanting. I also never travel with an aerator, though I do use them in a pinch when taking wine to local outdoor events, and occasionally at home if in a hurry with a young red, etc. I use an aerator for really young reds but have never tried it on whites. I'll have to try that someday. I decant Oregon Pinot Noir usually as I have found through experience they open up more. Real old wines I rarely decant as I like to treat them gently. Sometimes if we are putting on a wine tasting I will decant the wines and then pour them back in the bottle so they open up some. @pullthatcork – I have decanted to white wines, but only *very* rarely. Based on the comments so far, I might be doing that more often, though! With young, big red wines- I like to funnel the wine into a large decanter, then funnel the wine back into bottle, then back to the decanter. This back and forth gets air into the wine, yet it is still gentle enough to use on the delicate Burgundies. The blender method that the Modern Cuisine brings up for the old vintage Bordeaux makes me puke. And, though it may be the most recent sommelier fad, decanting some types of Champagne is actually really great. Especially the sweeter styles, and the cuvées that see some oak aging. The decanting of Champagne creates silky bubbles and a broader nose on the wine, though some carbonation is obviously lost. Cheers! @fatcork – The double-decant! Yeah, that one is great especially if you are bringing the wine to a dinner later but want the decanting to happen beforehand. I have never decanted a Champers but now I need to put that on the To Do list as well. Cheers! @fatcork – Oh, just wondering… how do you feel about putting Champagne through the aerator products? aerating an effervescent beverage should only lead to disaster. Much like putting Riesling into a sodastream. (I''ve tried to sparkle still wine at home, it did not work well). And does anyone have a good trick at keeping wine ambient temperature when in a decanter? Thanks for that link. I do have a trick on the decanter temp – I put it in the basement where it's… cellar temperature! I would add that I don't use the decanter regularly myself – it's just my preferred method for really good (and/or highly sediment-ed) reds. I use my nose to determine if decanting is necessary. If I intend to consume the entire bottle (talking red wines) like for a dinner party, then I will certainly decant. However, when I drink alone (yea, with nobody else) I prefer not to decant as I will usually consume the bottle over a 2 or 3 day period. I really like to see how the wine develops over this period of time. Pete T. – And you know when you drink alone… you prefer to be by yourself (and not to decant :-). Cheers! We really only decant when we have guests, but if are planning on finishing the bottle, it's a toss up. I only decant when we are opening an older or particularly expensive bottle… or if a friend recommends it. I use an aerator on most other red wines that I open. Even if I'm not decanting, I'd really prefer to open the bottle awhile before serving it, but with a baby and my wife and I both working full time, there usually isn't time (or with everything else going on I forget to open it early) … so I just use an aerator. I use an aerator on all dry, red wines. I'm not very good at waiting. i'll decant anything which seems tight on first taste. If I'm impatient I'll use an aerator, with my current preference being for Soirré. I've also used an inexpensive filter and let the stream of wine cascade 10-12 inches to the glass. Looks impressive, does the job (though not delicately) but there is always the possibility of spill or splash. I have small encapsulated ice cubes (for lack of a better word) which can be added to a decanter without diluting the wine. Also great to offset the sun hitting a balcony table. Thanks, all! We have a winner and it's billgeorge767! The giveaway is now officially closed.